They frequently visit Goa for holidays as it’s their most preferred holiday destination, and MJ5 are now looking forward to moonwalking on Goa’s beaches and getting others to follow suit too. 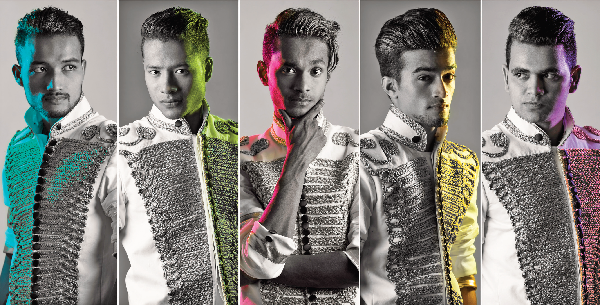 Known for their unique dance style which has been inspired by the King of Pop – Michael Jackson, the boy dance group comprising of Karthik, Rohit Himanshu, Vishnu and Dennis, rose to fame after winning the 2013 dance championship India’s Dancing Superstar aired on Star Plus. Since then, they have been an entertainment favourite for various shows and events. Apart from performances across the nation, they have also been jury members and often conduct workshops at college festivals.The group often performs free at college festivals with the aim of popularising dance among the youth. “We have been known for innovating the animation style dancing ensuring that we follow our immortal idol, The King of Pop - Michael Jackson. Be it any song, or piece of music, we only dance his style. It’s challenging to follow the same dance style each time, yet exciting as we need to think a lot to innovate the various moonwalks,” shares Kartik, adding, that the group is a record holder of 26 moonwalks and have applied for the Guinness records under the category of ‘maximum number of moonwalks invented’. An international favourite for private events, the group who has performed recently in Hong Kong and Bangkok are now also all set to appear in the upcoming movie Hijack, the shooting of which is going on. They are also associated with Navy, Cry Foundation and Smiles Foundation and were a part of the Tata Mumbai Marathon 2018 in January which was for the cause of educating girls. “We have pledged; to participate in all possible events to raise funds through our dance performance to support this cause,” quips Vishnu. Apart from this, the group is also coming up with a YouTube series on various social issues in a humorous way, informs Kartik. “The formats are talk shows, musical videos, gags and songs. The launch video is planned to be shot soon on YouTube,” he says. It’s like a ‘dream come true’ for the boys. “The journey with MJ5 has shown things which I would never have seen, life has flipped and hopefully will keep throwing surprises,” says Himanshu. Witnessing some bad patches in their journey, MJ5 has managed to come out of it. “The journey has been long with some serious ups and downs but we have come out of them all and been a strong group. It’s difficult for five boys to be equal minded and never have differences. But in our case, the bond strong and we have been together for five years without any disputes,” says Himanshu. However after winning India Dancing Superstars, one team member left the group and was quickly replaced by Dennis. But the group claims that they have since suffered owing to ex- team member copying their dance routines and illegally using the brand name MJ5. “Recently we have also been victims of dance plagiarism by him at an international level. But nothing lowers our spirit and we always throw back as a team, much stronger, much entertaining than most of them in the industry,” says Himanshu. When asked how they fight back such stressful situations, all answer unanimously, “By spending a few days in Goa. And they are now looking forward to spreading the joy of love for dancing in Goa too. “We are coming up with workshops pan India at various places. And we are sure to have one such workshop in Goa as well,” smiles Kartik.